It has finally arrived! Your Spring Break is here! 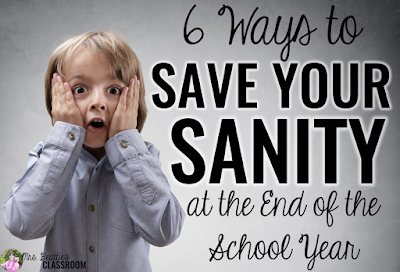 I know just how you're feeling: The kids in your classroom, while you love them dearly, are driving you nuts, with constant arguing and listening skills that have gone out the window. You've only recently finished report cards, and the many extra hours outside of your teaching day have you living on coffee and whatever you can eat while sitting in front of your computer. Make the most of your time off. It will be over before you know it! This HAS to be the first tip mentioned, and prepare yourself to hear it again at the end of this post! 😉 It is first AND last for a reason. Bringing school work home with you, tempting as it may be, may be the #1 way to ruin your break. Ahem... it is called a BREAK for a reason! If I have a bag of marking or a unit to plan sitting in the other room, I can feel it silently judging me. (Okay, that may be a bit extreme, but you know what I mean!) Every time you do something fun, you're going to feel like you really should be doing that instead. That is no way to have a break. Leave. It. At. School. I bet you have at least one new book sitting on your shelf or device that you've been hoping to read, but haven't given yourself the time to crack open. Do yourself a favor and lose yourself in a story! This just might be my favorite thing to do during holidays because there are just SO MANY possibilities. What about a manicure or pedicure, or BOTH!? Wouldn't a night out at your favorite restaurant be fun? What about renting a movie you've been wanting to see, or hitting the theater with a best friend or partner? How about splurging on a nice bottle of wine and sipping it in a bubble bath?! 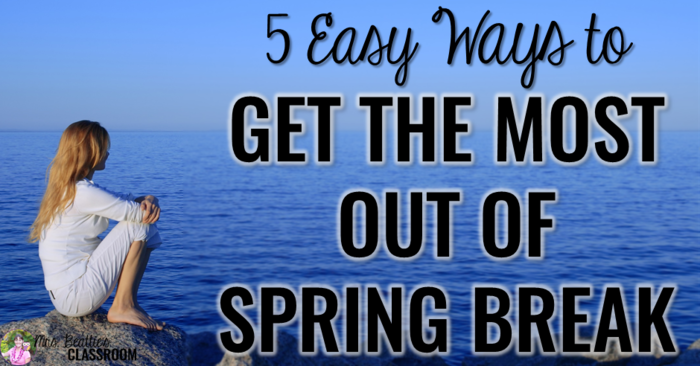 I know what you're thinking, but getting away doesn't have to mean a flight to an all-inclusive resort on some tropical island hours away from home. What about a local getaway? Do a little research: Are there any family-friendly attractions or appealing couples-only destinations near your home? Are there any Spring Break deals in local hotels? Any concerts or theater events catch your eye? You'd be surprised how much a couple of nights in a hotel only an hour away from home can feel like a week away! Finally, don't forget to take time to be with the people who are important to you. Spend time that you might normally be doing school work with your family. (You might not recognize them at first, but trust me, they're friendly! 😄) Pick up the phone and call a friend you haven't spoken to in a while. Meet a relative for coffee or lunch. Whether you're home or traveling, make time for the people in your life! Don't let your job get in the way of your relationships. THEY are what matter most. My husband and I on a recent trip to Egypt. NO work allowed! Back to that first point for a moment... none of my other tips are going to work for you if you bring a bunch of school work home with you. Work a little longer tonight, head to school early tomorrow, do whatever you need to do to get organized for your first couple of days after the break now. Then, walk out that door, close it behind you and don't think about school again until Sunday evening at the END of your Spring Break. Thanks to Whimsy Workshop Teaching for the palm tree clip art used in the headings.